With MEGADETH’s new album Dystopia set for a January 22nd release via Univeral Music Enterprises, the band is now streaming the album's title track and you can check it out below. MEGADETH has also announced that they will give their fans the ultimate cutting edge experience in Virtual Reality. The band will head into a special Virtual Reality set-up with director Blair Underwood where they will perform and film five songs from Dystopia - "Fatal Illusion", "Dystopia", "The Threat Is Real", "Poisonous Shadows" and "Post American World". As a director, DGA member Underwood directed the 2009 independent feature The Bridge To Nowhere, as well as several music videos, short films and commercials. He is currently recurring on ABC's hit series, Marvel's Agents Of S.H.I.E.L.D. 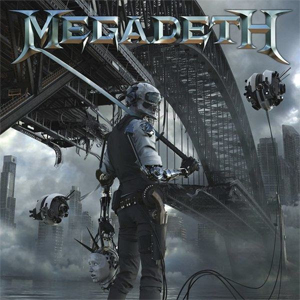 The band's performance will appear within the fallen city of a dystopian world modelled after the world created in MEGADETH's new music video for "The Threat Is Real”. Next Galaxy Corp., a leading developer of innovative content solutions and immersive consumer virtual reality technology will create a dystopian universe surrounding the band, and allow fans to virtually enter, engage and explore this parallel world. Released on January 22nd, fans will be able to purchase the new album, a CEEK Virtual Reality cardbox headset with instructions, and a download code to access and unlock exclusive content, which will also be simultaneously launched with the release of Dystopia to begin their VR Experience. This special CD package will be available at all physical and online retailers. Exclusive hand-signed bundles for the upcoming Dystopia album are now available for pre-order in the official MEGADETH store.